Every year BT supports a variety of young people into employment. Some come needing work experience and a final polish of their CV, whereas others need help to build confidence and aspiration as well as employability skills. 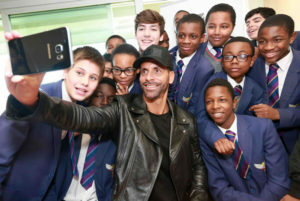 The journey to sustained employment begins long before they set foot ton an employer-led programme; that’s why BT is working with the Rio Ferdinand Foundation (RFF) to create a pathway for hard-to-reach young people, from grass-roots engagement to work experience and vocational training. It’s a partnership that capitalises on the strengths of both organisations. The RFF’s tried and-tested outreach and youth development programme is one that has the needs of young people at its heart. They work with them on their home turf, building confidence and skills through sports, arts and media pathways, and broadening horizons by exposing them to new experiences. The RFF team knows when the young people are ready to take their next steps. They are invited to get a taste of BT at a one-day skills for work boot camp. If they like what they see, they’ll then join us for a three-week work placement. They’ll be part of a group participating in a mix of classroom based skills development, hands on work experience, mock interviews and practical application support. Post-programme both teams work together to help the young people into sustained employment. At BT, we’re committed to helping as many young people as possible enter the world of work, and to ensure regardless of background, ability or past achievement they are supported into the role that’s right for them. To date over 3,200 have joined us for a placement. You can find out more about BT’s work ready programme at www.bt.com/workready.